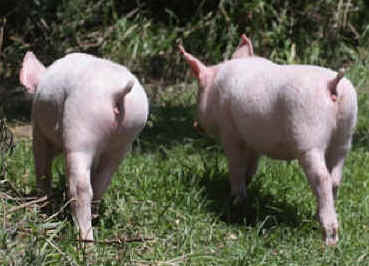 Two very ill piglets rescued from a pig factory by ALV / Uproar on December 4, 2010 have not only survived but continue to improve every day. Coco, a two week old piglet who was found dragging her two back legs along the metal floor with one knee joint swollen to the size of an orange is now walking! And Chloe who was found comatose on the floor being trampled by her brothers and sisters is now happily leading Coco around the paddock finding all the best spots to dig up! It was a long and often tense road to their rehabilitation, thinking at one point Coco may have to be put down if she couldn't walk, but thanks to the excellent help of John The Vet and his staff, and the loving care and dedication of their two full time caretakers the piglets are thriving. These little piggies are no longer going to market! They are in a very loving home and are now given the respect and protection they deserve. Thank you very much to everyone who helped them, the open rescue team, the vet, his staff, all the caretakers and everyone who supports our work financially and ethically!